FIRST Robotics - It's the hardest fun you'll ever have! A unique varsity Sport for the MindTMdesigned to help high-school-aged young people discover how interesting and rewarding the lives of engineers and scientists can be. A widely-accessible robotics program designed to inspire students to explore and pursue science, technology, engineering, and math (STEM) in grades 7 through 12. Introduces young people, ages 9 to 14 to the fun and excitement of science and technology while building self-confidence, knowledge, and valuable employment and life skills. Focused on building an interest in science and engineering in children ages 6-10, students work with LEGO elements and moving parts to build ideas and concepts and present them for review. FIRST (For Inspiration and Recognition of Science and Technology) was founded in 1989 to inspire young people\'s interest and participation in science and technology. Based in Manchester, NH, this not-for-profit public organization designs accessible, innovative programs that motivate young people to pursue education and career opportunities in science, technology, engineering, and math, while gaining self-confidence, knowledge, and life skills. The founder, Dean Kamen, is an inventor, entrepreneur, and tireless advocate for science and technology. His passion and determination to help young people discover the excitement and rewards of science and technology are the cornerstones of FIRST. Over 300,000 youth and more than 120,000 Mentors, Coaches, and Volunteers from over 60 countries participated in the 2013-2014 FIRST season. FIRST's Progression of Programs consists of four programs - FIRST LEGO League Jr (FLL Jr), FIRST LEGO League (FLL), FIRST Tech Challenge (FTC) and FIRST Robotics Competition (FRC). The programs vary by age and challenge so that learning never stops building upon itself. Starting at age 6 and continuing through middle and high-school levels up to age 18, young people can participate at any level. FIRST Illinois Robotics participates at Techweek in Chicago - check it out! In April, the four programs culminate in an international robotics competition and celebration where teams win recognition, gain self confidence, develop people and life skills, make new friends, and perhaps discover an unforeseen career path. To view a summary of this amazing event, watch the 2014 FIRST Championship Wrap-up Video . Learn more about FIRST, its robotics programs, and the FIRST community, by clicking on the programs above. Below is an interactive map you can use to see where teams for each program are located in Illinois (mapped by city). Each team is represented by a balloon that is color coded per each program. 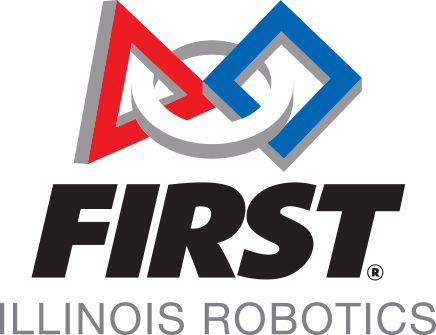 Connect With FIRST Illinois Robotics through Social Media!